A few weeks ago I received a question about my essay titled, “Orchestral percussion in the twenty-first century” in “The Cambridge Companion to Percussion” edited by Russell Hartenberger. Question: Are the bass drum descriptions of Turkish/Scottisch [bass drums] reversed on page 23 [of the Cambridge Companion]? My Response: This is an interesting question basically about nomenclature. The terms “Turkish bass drum” and “Scottish bass drum” are described in the “Cambridge Companion” essay exactly as I have always known them. In “Percussion Instruments and Their History” by James Blades on page 205 you can find the following text – “In Venice there is a painting by Carpaccio (early sixteenth century) which shows a Turkish musician playing a drum [davul] almost exactly the same shape and size of the military instrument we know today, and supported the same way – on the player’s chest.” A black and white photo of the Carpaccio painting is shown in fig.92 – opposite page 208. Blades uses the term “military bass drum” to describe a bass drum with a head diameter larger than the shell depth (fig. 141 after page 288). 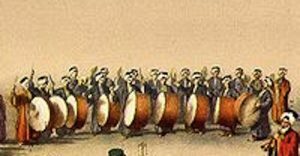 But there certainly are examples of 18th and 19th century English/Scottish/American military bass drums having a shell depth at least as large as (or greater than) the head diameter. 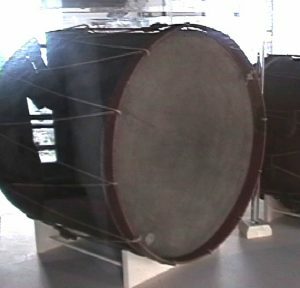 There are several bass drums having this large shell depth on display at the museum in Fort Ticonderoga, New York, and reproduction bass drums with this shape are used today by 18th-century styled ensembles like the Colonial Williamsburg Fifes and Drums. 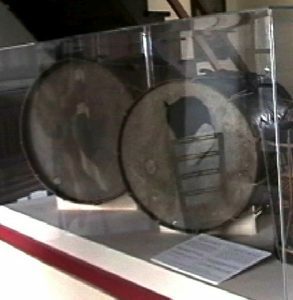 All of this notwithstanding, there are examples – either of Turkish or Scottish/European bass drums – that have either of the two opposing characteristics – for example – Blades fig. 125 and fig. 129 (both Turkish) having a shell depth larger than head diameter; and note the European bass drum in fig. 128 with the same characteristics. So, to respond to the question – since I haven’t been able to find any formal definition for the terms “Turkish bass drum” or “Scottish bass drum”, I have used my own definitions in the essay for the terms as I know them.